Wait a minute... I thought I saw a pink pickle... and now Marcello drew his own pickle. lol copydawg! Uh... uh... uh... But PURPLE?!? >_> Well, good job anyway. ALMOST as hawt as the pink one. ALMOST. Pickle madness!!!! WAIT...Is it KOSHER? I like how Marcello's pickle bumps are nicely aligned in a grid. 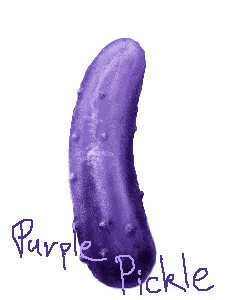 Nice Purple Pickle!Ya I agree nice textures! !